The College Gates, with Pearsons Hall in the background, after being built in 1915. The bell denotes the "Camino Real de San Bernardino," marking distances to the Mission San Gabriel (28.8 miles), Los Angeles Plaza (37.7 miles), and San Bernardino (24.2 miles). Pomona College was incorporated on October 14, 1887, by a group of Congregationalists who wanted to recreate “a college of the New England type” on the West Coast. Instruction began the next year in a small, rented house in the city of Pomona. 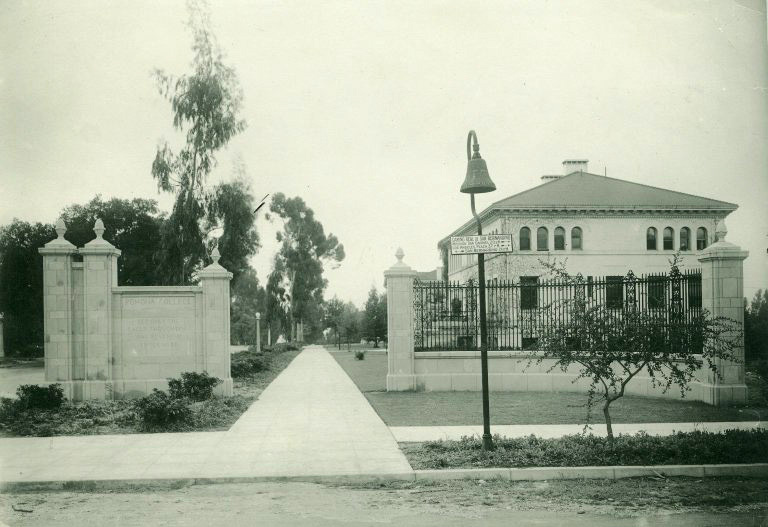 By the 1920s, Pomona President James A. Blaisdell faced a difficult choice—to limit expansion to retain the College’s unique character or allow growth and expand into a university. Under Blaisdell’s guidance, the College chose a third path. Using Oxford and Cambridge as models, Pomona founded a consortium unlike any other in America. Over the next 75 years, two graduate schools and four other undergraduate colleges joined Pomona as members of The Claremont Colleges, located on neighboring campuses, allowing cross-registration and sharing important facilities such as libraries.